A cross between a Magnolia liliiflora and a Magnolia stellata, an Ann magnolia is a deciduous flowering shrub or tree that can grow up to 20 feet tall with an equal spread. Ann magnolia trees are prized for their large, fuchsia and goblet-shaped blossoms that bloom prolifically from early spring to fall. Simple to cultivate, Ann magnolia trees require little special care and look great in your home landscape. 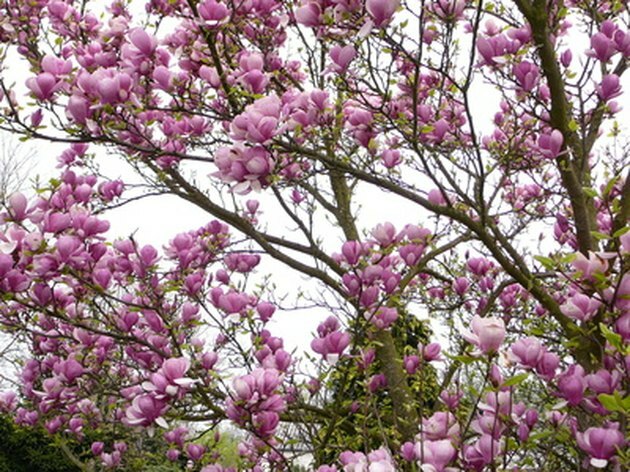 Grow a beautiful Ann magnolia tree in your home landscape. Provide regular irrigation for your Ann magnolia tree to keep the soil around it consistently moist. Water the tree whenever the surface of the surrounding soil feels slightly dry to the touch. Give your Ann magnolia tree a boost of nutrients in the early spring, before new growth is produced. Fertilize the tree with an application of a balanced, water soluble fertilizer that has been specifically formulated for use on acid-loving flowering trees. Apply the fertilizer application according to the directions on the product label. Prune the Ann magnolia tree annually to maintain the desired size and shape. Cut out any problem wood, including diseased, damaged or dead branches, with a pair of sharpened or sterilized pruning shears. For best results, prune your tree in the late winter to minimize the bleeding of sap. Monitor your Ann magnolia tree for signs of common insect pests such as snails, scale insects, thrips, weevils and planthoppers, as well as plant diseases such as fungal spots, powdery mildew and bacterial leaf spot. Contact your local agricultural extension office for prevention and treatment advice.